This was followed with the reading of the minutes from the previous year’s AGM by outgoing Secretary, Mark Golden, and these were adopted. Outgoing Treasurer, Celina Sheehan, then proceeded to give her financial report for 2017, which showed an increased income of approximately €55,000 over the previous year. She put this increase down primarily to the, Anonymous Charitable Donation of over, €24,000, received towards the purchase of the former St. Peter’s Church and the ongoing success of the monthly fundraising bingo nights and again this report was adopted. “2017 was an incredibly busy year for the CDA. Thank you to our main sponsors Murphy’s SuperValu and Celtic Sea Minerals who along with all the other sponsors enable us to carry out the work that we do throughout the year. St. Patrick’s Day was the first event we had as a new committee, and we would like to thank Anne Marie Cronin who puts a massive amount of work every year into the St. Patrick’s Day Parade and despite the weather, the show went on. Following that we had our first ever Teddy Bears Picnic on Easter Weekend. The grounds of St. Peter’s Church were opened up to kids of all ages to run around. We had Face painters, a puppet show and even a teddy bear doctor on the day. St. Peters Churchyard provides a safe environment for kids and parents to enjoy and it is the CDA’s intention that this will be utilized as much as possible going forward. Also, that weekend we launched our Shop Local initiative, local people collected stamps in participating business and were entered into a prize draw. We are delighted that Marine Harvest Ireland came onboard to sponsor this. The draw was held over Regatta weekend and we had over 400 entries. We initially hoped to run it again till Christmas but a lack of advertising on our part meant people didn’t realize it was continuing. All cards that were full for Christmas will be entered into our next Regatta draw and we hope to do a relaunch around the upcoming Easter weekend. We held two days of a town Spring Clean in April. We were delighted to see so many volunteers turning up for both days. There was a real sense of community spirit and pride in our town. Unfortunately, this was massively overshadowed by the incident that happened to one of our longest serving committee members, Kieran Murphy. Due to this Kieran had to step back from the committee for the remainder of the year. I can speak for everyone on the committee when I say that events are not the same without his bubbly and enthusiastic personality. At the end of April, we unveiled a memorial Bench to “Seán ‘The Buck’ O’Sullivan”. We were joined by his family, friends and work colleagues. The large turnout just showed how highly regarded Sean was in our community. Towards the end of May we hosted the Ring of Beara Cycle’s main food stop. Over 4,000 cyclists came through the town on the day. One of the main beneficiaries of last year’s cycle was Castletownbere Hospital, who received over €25,000. Following on from that, also in May we held a photographic exhibition in the grounds of St. Peters Church. Shay Hunston, photographed 20 local people as part of his project entitled People of the Wild Atlantic Way. This exhibition ran throughout the summer. On the June Bank Holiday, we held our first Spanish Fest, it was great to see the business get behind it and provide Spanish food throughout the weekend. We closed Main Street on the Sunday for a street party and a running of the bulls. The 2017 regatta was another great success and we finally got sunshine on the Regatta Monday. We introduced a few new events and some old favourites. Thank you to everyone who helped out in any way and to the business for their support. In September we held various events in association with The Taste of West Cork food festival. This culminated in the Movable Feast, a brain child of, Mark Johnston, Head Chef in The Beara Coast Hotel. Guests gathered at the Hotel where they were split up into groups. From there they were collected and brought to various restaurants for each of the courses. Only the bus driver knew which groups were dining where. A fantastic event ensued, and it is hoped to grow it this year. For Halloween we turned St. Peters Church into a cinema for the night. We showed two movies and had over 150 people through the doors on the night. The annual Parish Newsletter was launched in November, and it seems to get bigger and better every year. Thank you to Sandra Regan, Dorothy Brophy and Michael Downey for all their hard work. And Joan Kelly who distributes them throughout the town. Finally, in December we purchased new Christmas lights for the East End of the town as well as erecting a Christmas tree in St. Peters Churchyard. On St. Stephens Day we held our second annual Treasure Challenge, which proved great fun for young and old. Bingo has proved to be ever popular, and we get an average of 180 people every month. It was decided after last year’s AGM to give the half time raffle to local clubs and charities. To date we have given over €7,000 to local charities. Originally it was intended to use the money collected at Bingo to finance the refurbishment of the Playground at the West End. Fortunately, late last year Cork County Council ring fenced funds to improve playgrounds in West Cork, meaning the CDA did not have to match fund the Council. The money collected at bingo will now be used for Capital Projects throughout the town. As many of ye know just before Christmas the CDA completed the purchase of St. Peters Church. We were in the process of getting a loan, kindly guaranteed by the local publicans, when we received a call that someone would like to donate to the CDA to purchase the church. This person wishes to remain anonymous but the CDA would like to heart fully express our gratitude for this extremely generous and kind donation. Cian, then stood down the outgoing committee and invited, Noel Forde, to chair the election of officers for the coming year. Committee Members; Deirdre Harrington, Grace Delaney, Mike Popovici & Rozalyn Williams. Noel wished the incoming committee every success for the year ahead. Re-elected Chairperson, Cian Murphy, then addressed the floor. “Thank you, Noel, I’m delighted to be chairman for the coming year. Just to outline our plans going forward, most events that we ran last year will return this year. The first event we will be involved in is the St. Patrick’s Day Parade, we are incredibly lucky to have Anne Marie Cronin who organises the day, and we assist in Traffic Management and bodies on the ground. The town spring clean in association with Murphy’s SuperValu will be going ahead. This year it has been extended to 4 Sundays, I would ask that everyone who is available could help. They will be held on the 8th 15th 22nd and 29th of April. On the Easter Bank Holiday we will be holding our annual Teddy Bear picnic in the grounds of St. Peters Church. Following on into May, the Rally of the Lakes will be holding its pit stop in town again this year. Also in May the Ring of Beara Cycle will be taking place. Castletownbere Hospital and also Castletownbere Day-care Centre will be two of this year’s beneficiaries. Spanish Fest has grown into a full weekend of activities and the Spanish Community has really gotten behind it this year. Plans are well underway to make this a huge weekend for the town. In July it is hoped to bring back our 5mile run. There is a newly formed Beara Athletics Club on the peninsula and it is hope the run will bring people to Beara for the weekend. The August Bank Holiday, our biggest event is growing year on year... We have a few new projects and events in the pipeline for this year’s festival. We are open to ideas for the week, If you or your business have an idea, would like to run an event or sponsor an event, just let us know. Throughout the year we will be hosting our monthly Bingo Nights. As I mentioned, the half time raffle goes to local charities, if you would like to submit a local charity for one of these, just let a committee member know. We have secured a grant from leader to conduct a feasibility study for St Peters. This company will conduct information evenings as well as consulting the local community. The CDA has secured the church for the community; the plan going forward is the community decides what happens. The traffic study is finished and is being presented to our councillors in March, following that it will go out for public consultation to be held here in the hotel. The CDA will not get to see the final draft until it goes for public consultation. For tonight, as there is no formal plan, when I open the floor I will not be taking questions on the traffic study. The project is now approved to proceed to the Detailed Design and Planning stage. Following that, the next phase (including planning permissions, site investigations, environmental surveys, necessary licenses, land acquisition and wayleave, procurement) will continue through to the latter part of 2018. Construction would then be expected to commence in 2019 with duration of 1 to 1½ years. Irish water has agreed to meet with the CDA on the 9th March and we will be outlining the necessity to have these works completed as a matter of urgency. The website is being upgraded as we speak, there is a lot of work being put into it and once it is ready we will announce it through our Facebook page. John Galvin will give a quick presentation on the works done to date later in the meeting. I would also like to thank the incoming committee for giving of their time and I look forward to working together over the coming year. Cian then invited, PRO John Galvin, to give an update on the progress of the website and a quick demo of our social media pages. A lengthy discussion was had on the issue of dog fouling which lead into the litter situation in general around the town. Barry Harrington of Castletownbere Tidy towns again raised the issue of the public bins being used for household waste and that people are still leaving full bags alongside these bins. He recorded 14 bags of rubbish being collected in the last weekend alone and that the situation has not improved in the last 5 years. Comments on this suggested that the restricted opening hours of the Waste Transfer Station had a huge bearing on the situation. Councillor, Danny Collins, informed the meeting that he had raised the opening hours issue again recently at a council meeting and was told that they are looking into the possibility of opening the Castletownbere Facility for an extra day per week, possibly on a Monday. Another suggestion from the floor was to reinstate the bins that have been removed and to investigate getting dog fouling bag dispensers installed in the worst areas. Councillor, Paul Hayes, addressed these issues and reiterated Councillor Collins comments in relation to the opening hours and informed the floor that the council offer a subsidized compost bin for €25. Chairman of Co-Action Beara Branch, Wayne O’Sullivan, commended the committee for their ongoing work in the community and thanked them for being invited to host a recent Bingo Interval Raffle. 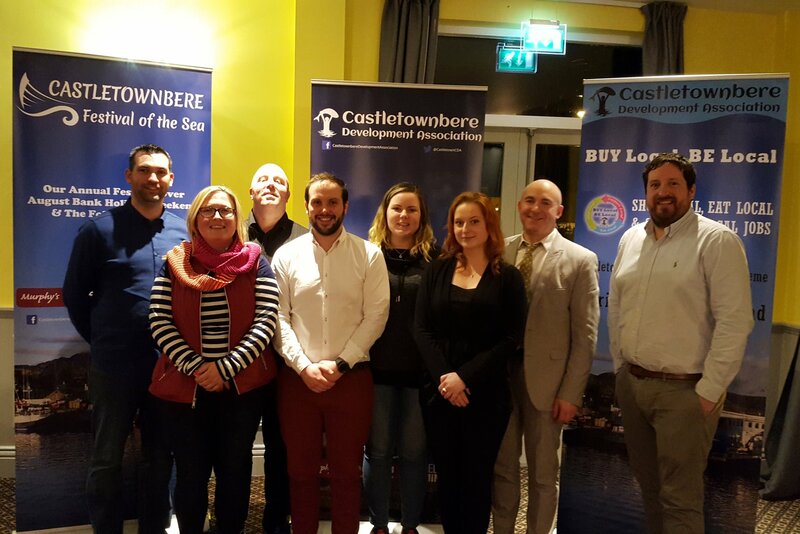 He informed the floor that as part of the Castletownbere Fishermen’s Co-Op anniversary, Co-Action has received €250,000 to build 2 new special needs houses in the town and that plans are currently being drawn up in conjunction with cork county council. The meeting was informed that the current Electric Car charging point takes up to 8 hours to charge up a car and that there is no fast charging point outside of cork city, which only takes 40minutes to full charge. There are TAX incentives available for businesses to install these fast chargers and the committee was urged to look into it. A suggestion was made to possibly set up a Youth branch of the CDA, which could be a Transition Year project or similar to, encourage the current youth’s in the town to become more involved in the running of the town and events. Councillor, Patrick Gerard Murphy, also wished the new committee well for the year ahead and said he was delighted to see that the church is finally in the hands of the community and looks forward to assisting in anyway with the redevelopment in the future. He also informed the committee that the County Council & Dept. of the Marine are in close consultation to finalise the sewer plan for the town and that he would be in touch in the coming weeks to bring the CDA up to speed. Finally, Councillor, Paul Hayes, spoke of how well the AGM had been organised and wished every success to the community and the committee for the year ahead. The meeting concluded with Cian thanking everyone for their attendance & comments and promised that he and the committee will continue to work tirelessly for the community during the year ahead.